I've attached our MTI template. The logo is on the bottom right hand corner. Option 1: Based on this logo, will you then be able to do up a colour caricature of our colleague's face, with the logo in the background or surrounding his face? Option 2: Another option is to have 3 scenes behind his face plus the logo. I'll attach the 3 scenes as well. SCENE 2: FORMULA ONE RACING: We do not have a particular picture on this. This can be up to you. Any drawing of the formula one racing scene/car will do. *Please note that all the scenes only will be in coloured cartoon images. 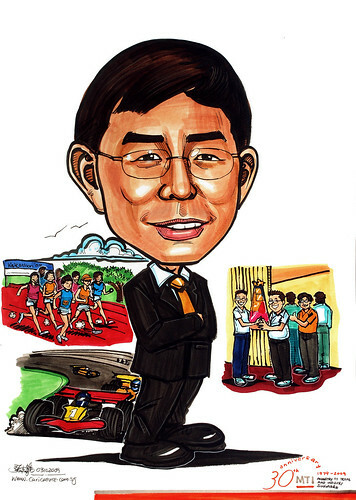 And colleague's face in colour caricature."